We are each called to be God’s servants! Many times throughout the year I will challenge my students with the questions WHAT WOULD JESUS DO? and HOW CAN YOU MAKE A DIFFERENCE? That really is what Christian Living is all about! Weeks 28 and 29 As we continue to try to be difference makers, we are getting very exciting about our M.A.D (Make A Difference) Yard Sale! We will divide all the proceeds raised from our yard sale to make donations to charities that we have researched who support local, national and world issues such as poverty, animal extinction, hunger, homelessness, etc. HomeSHARE: Parents, talk to your child about the issue they are researching and the charity they are supporting. Discuss with him/her how he/she will contribute to the M.A.D Yard Sale! Weeks 26 and 27 We have continued to work on self improvement during the Lenten season. We are goal setting and trying to make a difference for ourselves and others. One of our goals is to complete our 60 km walk for Chanie. We’re getting there! HomeSHARE: Parents, consider going for a walk with your child. It’s time well spent! Weeks 24 and 25 Lent is the season when we prepare our hearts for the coming Easter. It’s kind of like a “spring cleaning” where we focus on becoming better people. Jesus died for us and we want to be the best people we can be. Our class is focused on being difference makers. During this Lenten season we are working on making a difference for ourselves and others. HomeShare : Discuss with your child different ideas that he/she may have for self improvement and for improving the lives of others. Week 23 Our Lenten Letters are published! We now look forward to podcasting (voice recording them) to improve our reading skills! HomeSHARE- Parents, share with your child what you are thankful for, what you appreciate about yourself and something you’d like to improve on! Week 22 We will spend this week, the first week of Lent, reflecting on all of the things we are appreciative of in our lives, the characteristics and qualities we appreciate and respect about ourselves and the one thing we’d like to improve on. We’ll write a “Letter to God” to share or thoughts. Below is our resources. The PDF version can be downloaded by clicking on Lenten Letter to God. Upon completion of their letter, students will podcast (voice record it). Check out ‘Why Podcast’ for information and resources. HomeSHARE- Parents, have your child share their letter with you. What do you believe are your child’s greatest qualities? Tell them why! Weeks 20 and 21 Our class spent Valentine’s Week writing compliments for one another. They received a Compliment Booklet compiled full of their compliments on Valentine’s Day! Mr. C loved watching all the kids enjoy reading their heart felt compliments from their peers! HomeSHARE- Have your child share their Compliment booklet with you? Which is his/her favourite compliment? Why? Give your child a compliment of your own! Week 19 Our Catholic virtue for the month of February is Honesty. Students did some reading on the topic and then wrote a descriptive paragraph to explain what Honesty meant to them. The kids also created digital posters to remind themselves to be honest everyday. HomeSHARE: Parents, ask your child to share their Honesty paragraph with you. Discuss a time in your life when you were honest or dishonest. Week 18 The virtue for this month is Courage. We let the poem “Don’t Quit” guide our learning. The students wrote a reflection about what the poem meant to them. HomeSHARE: Parents, ask your child to share the poem with you and discuss. Week 17 To begin the new year we reflected on our ONE WORD goals that we set for ourselves at the beginning of the school year! We are now more determined than ever to still to our goals and work at being even better people! HomeSHARE: Parents, ask yourchild what their word is and discuss. Will you set a ONE WORD resolution? Throughout the Advent season our class spent time preparing our hearts for the coming of Jesus’ birthday, understanding the Christmas story better and GIVING! Read all about our M.A.D (Make A Difference) for Christmas GIVING project: M.A.D 4 Christmas and the Nativity story from the perspective of a snowflake: The Snowflake (scroll to Days 5-8). HomeSHARE: Students share your M.A.D journal with your parents. Did you complete your project? Have you SHARED it with others? Please do! Week 13- M.A.D 4 Christmas! HomeSHARE: Students share your M.A.D 4 Christmas idea with your parents. Remember your idea does not need to be big and elaborate, sometimes the simplest acts can make the BIGGEST difference! Parents, please give your child some feedback on their idea. Is it doable? Is it realistic? Does their idea need to be changing or modifications? Our next step will be the planning stage! We have started to look forward to the coming of Advent and are working to prepare for the coming of Jesus’ birthday. We are now focusing on making a difference for others and have started to brainstorm small random acts of kindness that we can “gift” others with during the Advent season. Below are some students’ ideas. HomeSHARE: Parents have your child share with you some of their Advent plans to make a difference for others. Can you team up with your child on one of their Advent “make a difference” ideas? Our Make A Difference project has been officially launched and we’ve been hard a work on our M.A.D Journals. Matthew West has quickly become one of our favourite artists to list to. He inspired our digital art this week with his song “My Name Is…..” Check out our Art Corner to see our “My Name Is…” name tags! HomeSHARE: Visit our Give4ChristmasChallenge website. Brainstorm something your family can do to make a difference during the Christmas season! We have spent the week talking about peace and how we can keep the peace at school, at home and even with our selves. The message to the right is one that the students will see every day, first thing in the morning, during the month of November. HomeSHARE: Parents, ask your what their peace keeping plan is! Discuss why it is important to realize that peace must begin with us! We have been talking a lot about personality traits, both in the main characters that we have been reading about and in ourselves. We must understand and love ourselves before we can truly love others. We’ve continued to work toward making positive differences for ourselves and spent time this week talking about “character”. I love the quote by John Wooden below. It has sparked many deep discussions and reflections. HomeSHARE: Discuss with you child what this quote means. This week, we continued to focus on how we can make a difference for ourselves to become even better people. We painted our #onewords on a rock (see the Art Corner) and brought our rocks home to put in a spot that we’ll see every day. We are now reflecting on what our words really mean and how we can put our words into action. We also spent the week brainstorming all of the things we are grateful for and drafted and published our Thanksgiving prayers (see the Writing Wall) that we will share with our families at tThanksgiving dinner. Our Thanksgiving collages were also fun to create! The kids were SOOO excited to start the One Word Project! After reflecting on our own talents and gifts we brainstormed words that we’d like to have as a goal to self improve. We know the first step in making a difference, is making a difference for ourselves! I was very inspired by the kids words! Visit our Art Corner early next week to see the students’ digital images. HomeSHARE: Ask your child what his/her “one word” is and why they chose it! We are working on recognizing our own and one another’s gifts. We look to Jesus as an example and role model. We brain stormed all of Jesus’ great qualities and listed strong adjectives to describe him. We then self reflected and listed our own great qualities. HomeSHARE: Parents, discuss with your child what you believe are the 3 most important qualities that your child has. We have been spending time getting to know ourselves and one another better in the classroom. 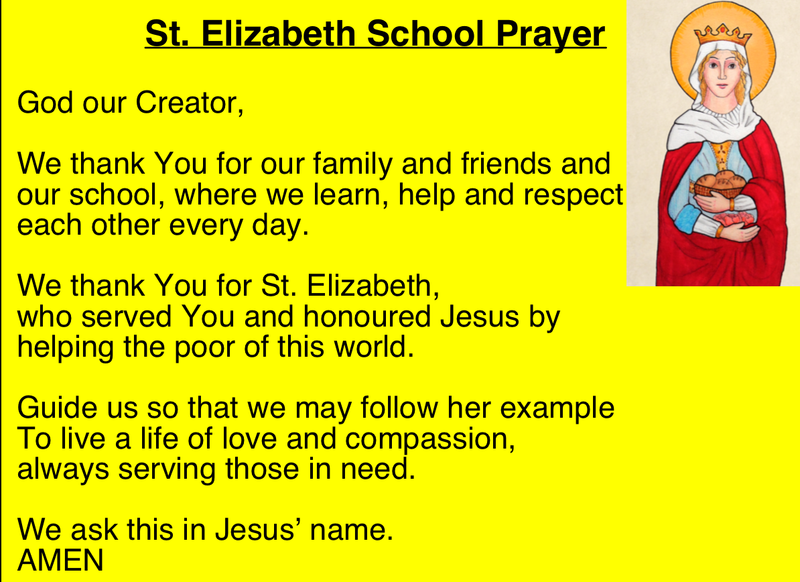 We start each day saying the St. Elizabeth school prayer and praying quietly for a few moments. We end our day by saying the Hail Mary together and celebrating the great happenings within our classroom. I encourage parents to spend a few quiet moments each day talking your children about the things that truly make them happy and the things they are most thankful for. HomeSHARE: During week 3 students will be working on their “One Word” Goal for the year. Speak with your child about what his/her word will be and why!